Oh, who cares. I get tired of analyzing myself, sometimes. Whatever the reasons, I am in one of my Beginnings modes. I was in one this time last year, and the year before. It's fairly standard. The depression I discussed in my last two posts continued to be a burden to me over the course of the summer, occasionally dipping into debilitating emotional crises. But I met with my psychiatrist late in August and have been building a new program for mental health ever since: aside from tweaking my meds, I am also diving into the deep end of the talk-therapy pool. I started off with a depression support group, which at my first appointment turned into a private consultation as none of the rest of the group showed up. I found it very cathartic, revealing some fears I am experiencing in relation to Grandmother, and discussing ways of working through those fears. The second meeting brought one other person into the group, but the group is going to be ending after the next meeting, as it is not very well attended. The therapist who runs that group felt, though, that I would benefit from attending a social anxiety/phobia support group. My fears of losing Grandmother, while perfectly natural, might be less debilitating if I had a larger support system of friends and social groups built around myself. That made sense, and I know a lot of my other issues in life have to do with social phobia, my insane fear of rejection and my overwhelming sense of embarrassment in groups. She felt that I could probably be very successful, since I have in the past been socially phobic but managed to become a sociable person, but then lost the knack for it, rather than having been asocial my whole life. Having once overcome the fear, I can look forward to finding ways to overcome it again. I didn't fully realize how small my world has become in the last few years; I knew that I had pushed away or lost track of most of my friends, these last few years where it's been very difficult to reach out beyond myself to connect; but I did not really think about how that was feeding my depression, how it was keeping me from building better coping mechanisms. I am also, at the same time, starting a therapy group for gay men. Though I don't really think my depression and my sexuality are all that much linked, it is nice to be around people you don't have to tell you're gay (I am still not used to that... I used to be so obvious, but now I get older and tireder, and now that straight men are more allowed to be feminine, I find myself having to say it aloud). Anyway, I'm looking forward to having a forum in which I can discuss things that are bothering me. My chief hope is that these two groups will help me to feel safe in groups again, and I will be able to rejoin AA, which I have not been able to attend very much in the last few years as the social anxiety made those rooms uncomfortable and upsetting to me. I miss AA a lot, the people I knew there and the serenity and joy I used to get from the program. So that's going on, and as I've learned in the past, doing something for my mental health is beneficial to my mental health regardless of the efficacy of what I'm doing... the mere act of doing something helps drag me out of the depths. These last few weeks, though I cannot say I am in glowing mental or physical health... in fact it has been like pulling teeth to get up some mornings, and between my allergies and an intermittent headcold I've been kind of miserable... I have not felt depressed (and by 'depressed' I mean weepy and suicidal) since I met with my psychiatrist and launched into all this therapy. Also, almost entirely due to the hypomanic episode that started two weeks ago, I have started a new writing project. It came to me in a flash late on a Sunday afternoon at the end of August, the idea of creating the character Lord Sebastian Saint-Clair, Viscount Foxbridge, a young gay dilettante in 1930s England who becomes involved in various mysteries and investigations due almost entirely to his inquisitive nature and his ability to mix in every level of society. The project has been intensely gratifying, and intensely stimulating. The amount of research required to recreate an historical period has been incredible fun, and informative as well, completely occupying my mind these last couple of weeks. I am planning to turn it into a serial novel, publishing it on its own blog as I usually do with my writing. I'll probably be using this project when NaNoWriMo comes around, starting a new story or two during November to see how fast I can write. The most interesting aspect is that I'm not planning ahead much. The first story, "The Problem of the Prancing Pole" was begun without me having any idea what the problem was going to be, who the murder victim was, or who the killer was. It was more like reading than writing... up until the last few pages, I didn't even know who the killer was; it was terribly exciting to figure out an appropriate solution from facts I'd established without an end in sight. Now I've started on the next story, "The Difficulty of the Diplomatic Dutchman," which so far involves some papers stolen from Baron van der Swertz, and will later on encompass a sticky-fingered rent-boy, perhaps a prostitution-and-blackmail ring, maybe a murder, possibly something to do with the contents of the missing papers and perhaps not... I have no idea, and am looking forward to finding out. I am also starting to backburner-cogitate on later story possibilities, utilizing characters I've introduced in passing so far: Lady Caroline Chatroy, the daughter of the Duke of Buckland; the Marquis de Mazan who has not been seen yet except for his name; the Tenth Earl of Vere, and his sister Lady Emily Saint-Clair; the Argentinian waiter Emmanuel and the hotel manager Paul Delagardie; and of course I'm going to have to drag Bunny Vavasor, Lord Foxbridge's best friend, into a nasty mess to be sorted out, all the while furthering the romance with Scotland Yard Sergeant Sir Oliver Paget. Much of the fun comes from making oddball references with the names. Paul Delagardie, for example, was the name of Lord Peter Wimsey's maternal uncle in Dorothy Sayers's novels; the Marquis de Mazan was one of the subsidiary titles held by the Marquis de Sade; the Vavasor family is featured in Anthony Trollope's Palliser novels, and Bunny is the name of A.J. Raffles's sidekick; Count Gryzynsky was the name Julie Andrews' character adopted in Victor/Victoria. Unfortunately, the hypomanic episode has already left me flat, and I've been finding it difficult to continue. But I'm going to keep plugging away because it gives me something interesting to think about besides how awful I feel at any given moment. 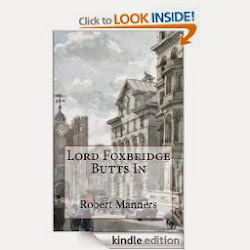 But if you haven't yet, go visit Lord Foxbridge Butts In and have a gander; and please do tell me what you think, I rely very heavily on feedback to keep me moving forward. So that's what's up with me just now. Hopefully I'll have energy to check in with you sooner than November 9th, which seems to have become the pattern here. I don't like neglecting this diary too long, it leaves these big holes in my own memory of my own history. And that just won't do.